The Health app, loaded onto all iPhones with iOS 8 and sitting prominently on the home screen, is clearly ambitious, but at the moment the majority of it’s intended abilities remain inactive or useless (at least without additional third party sensors, which don’t seem to exist yet). But for those with a new iPhone, the Health app can be useful right now, because it has the ability to track your steps like a pedometer, as well as flights of stairs climbed, and your walking / running distance. To track some of your activity, you’ll need to enable the functions and then add them to your Health app dashboard. This is all done through the Health app itself, but again, it requires a newer iPhone, as older models do not have a motion tracking chip used to function as a pedometer, or the ability to detect elevation. For best results with this Health app feature, you’ll need an iPhone 6 or iPhone 6 Plus, though iPhone 5S also has a motion coprocessor. Third party devices can also work, but we’re focusing on iPhone here. Now that the pedometer and distance movement functions are enabled, the rest is up to you, meaning you have to actually move around to see the statistics change. The steps feature is quite accurate as long as you have the iPhone with you – whether it’s in your pocket, in hand, or a pack seems to work and register as expected, and the mileage walking + running distance indicator is also apparently accurate enough from testing experience. The Flights Climbed function works well too, and is fairly interesting in that it uses the new air pressure sensor built into iPhones to detect even minor changes in altitude. Each “flight” is about the equivalent of a housing story of steps, so if you walked upstairs a single story in a house or office, it would register as a flight climbed. You don’t need to be on actual stairs for the flights climbed to register though, it takes the relative assumption of height into consideration and works even on gradual inclines and declines too. Separately, if you take a moment to poke around in Health app, it will demonstrate how ambitious Apple is with the app, either on future intentions of what various iOS devices will be able to do, or what they expect to surface from third parties. With the potential ability to track a huge variety of health and fitness statistics, from body measurements, to fitness, nutrition, sleep, vitals, lab results, and much more, the future looks pretty interesting, though at the moment Health app feels very half-baked due to it’s limited functionality and the apparently missing data input sources. If you don’t want to use Health app and have no intention on tracking your fitness or activity levels, you’re left to basically ignore the app. Much like other default apps, you can not delete the Health app from the iPhone, though you could choose to hide it either by stuffing it within a folder or using Restrictions to make the icon disappear from the home screen. Finally, it’s well worth mentioning that using these Health tracking features have showed no notable impact on battery performance, which is great news for those concerned about battery life in iOS 8. Of course, the iPhone 6 Plus has great battery life to begin with, so even if a tiny effect was there, it would likely be minimal and go unnoticed, and reports suggest the same for iPhone 6. One problem I’ve found is when manually entering data. For example, I run on an elliptical trainer for an hour and do just over 6 miles. I’m using my iphone to watch a TV show so it’s not moving. I have to manually enter the distance. But there appears to be no way of telling it that those 6 miles were cmpleted over an hour. I’ve also found the graph a bit odd. I do those six miles and enter it in and I see it in the list, but the graph doesn’t show higher than 5.74 on any days. I’ve noticed the same with manual inputs, it does not seem reliable enough so I gave up on that. I just let it track what it detects, which is pretty accurate by itself. With your example and the millions of others that use ellipticals and treadmills, it would track the steps, but not the distance obviously, and on an incline it would not detect the stairs climbed either. That’s a pretty glaring flaw, but it would be hard to correct without a tie in to the workout machine, or more simply, better input capabilities. To me it feels like Health app is very much a beta, but it was released anyway. Much of the longstanding rumors have suggested it would have deep sensor tie-in with Apple Watch, so perhaps with software updates and hardware, the data will be better once Apple Watch debuts. Health app must be beta, it’s such a weirdly useless app with all these features that can’t do anything. I was a bit surprised and disappointed to see that the Health app heart rate monitor doesn’t work though, when third party apps claim to do the same by using the camera. Maybe not possible any more? You need a heart rate monitor (HRM) to see that value. Pair one via Bluetooth and it will collect the data for you. If you want an app that will attempt to read off your HR, there’s a few out there, I tried 24/7, and it worked well enough. I don’t know if you can send the info of 24/7 to the health app so it’s centralised there. Anyhow, the health app does not capture the HR on its own. I had the same Problem… Here is how to FIX it!!!! The iPhone 5S and iPhone 6 have an internal step counter (the M7 and M8 coprocessors) that tracks your steps throughout the day. Based on these steps iOS will try to estimate the distance you walk and run. 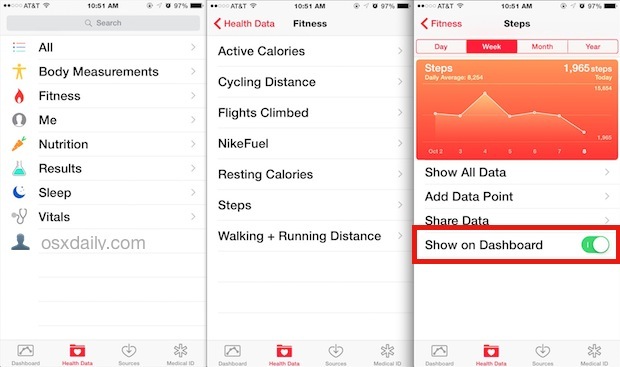 If you use multiple sources in the Health app, data should get nicely combined. This works excellent, as long as you give your favorite tracking apps HIGHER PRIORITY. The M7/M8 built-in step counter sometimes blocks other data sources like Human. If you give Human higher priority, Health automatically fills up any gaps we have in our data with the step count-based distance estimate. To change the priority for your data sources, open one of the data types, tap Share Data and use the Edit button in menu bar at the top of the screen. You can now drag the sources in the right order. Is there a way to click on a specific date to see that day’s data to get a total for that day? I will stick with Moves, at least for now. Yes, I know it is part of the FB Empire, and in fact I deleted it for some months. But Moves also tracks where I’ve been through the day, an immensely useful feature for me, so I reloaded it and glad I did. Thank you for this useful overview. I never had a pedometer before, and I am trying it out today…. I run on a treadmill and manually enter the distance… Then it doesn’t graph it. I like the idea but they’ve got some bugs to work out. Walking is off slightly. I run a marathon distance everyday (26.4 miles) and it only shows 26 miles. I have found that the app doubles actual miles/steps. So much so that I have to divide in half for more accurate results. Same here, it shows double the steps.. Regardless of it not using any battery, why can’t it be shut off? I enabled all three functions but at last nothing happens. What do you do, guys? Me too. No Data are found. So will not work with 5C? I have an iPhone 4s, and I have the update mentioned, but my app doesn’t track anything I do unless I manually enter it. Is it because of the iPhone 4s, or am I doing something wrong? I have iPhone 5, but steps and walking doesn’t work. Is it because of the old tech specs of the iPhone 5 or am I missing something? The Health tracker requires an iPhone 6 or newer for optimal results, the iPhone 5s has limited support and the iPhone 5 does not have a motion coprocessor. Is there a way to click on the date in the Steps on the Dashboard and not get every minute, but just that many steps for that day? I can see the current days steps on the dashboard, but nothing from the previous days, just on the graft, but not the number of steps. I would like to know how to do this too. It looks like someone else asked the same question, over a month ago, with no response. That would be a great feature to get day-by-day steps and mileage counts, but at the moment Health app doesn’t aggregate the data that way. Perhaps an update will fix it, because it would be very useful to go back by date, and to better look at specific periods of time. The data as presented away from the charts and graphics, when you tap on details, and you get the list of specific movements, that for now is rather useless to the average person. Similar to the above. When I enter manual steps it does NOT appear on graph. FYI I do NOT have my iPhone on my person when using the elliptical. I like the app but would enjoy the manual data entered to appear on graph like my weight does. I noticed that actively running the app sometimes slows the performance. Means it takes a huge chunk of the processor even if the battery is immune. I have an iPhone 5c and thanks to this thread im aware my phones health app will not fully function due to the lack of a coprocessor. However, I have a nike fuelband and am trying to figure out how to link the two together so I can track steps and such. Any help? On iOS 8.1.2. What do we have to do get heart rate on dashboard? Indeed you can add heart rate data and BPM to the Health app dashboard on iPhone, but at the moment you need to input your heart rate data yourself. There is not a system of measuring the details on the iPhone (yet), perhaps Apple Watch or maybe an app that uses the camera can tie in the data to Health app? Comparing distance walked on Dadhboard with walking distances on Google maps shows a huge discrepancy; I’m inclined to trust the Google maps distance.any observations? Which shows a greater number? How close are they? I would tend to trust Google too for distances, but keep in mind that when you are walking, the distance covered is often different than direct lines on a map distance would be, thus the Apple Health tracker may be providing accurate mileage data and step data. It uses the accelerometer to track the steps, and it must ping GPS to determine distance. I have found Apple Health to be pretty accurate, maybe off by a 1/4 mile or so in most situations. The one thing I have been frustrated about with the health app is the inability to see totals. Unless I have missed something I see no totals of steps, mile, etc. I would like to easily see how many miles I have walked in the last week or month without having to add the days. Am I missing something here? You are right, in the current Health apps the total steps, miles, etc for all time or per month or week are missing. Additionally there is no way to view longer term trends or charts for multiple months, years, etc. Seems like an easy thing to add, hopefully future iOS Health will add such features. Step tracking is way off for me. That another user says its doubled. I’m using an otter box case and holster. I’ve tried entering my hieght in the app but still way off. I’m not trusting that the apple watch will fix this issue. I may have to try another vendors band. The flights measurement is very erratic. sometimes it records low, and sometimes not at all. I am sure it is the app, not the built in barometer. I use cycle meter for cycling, and it reads elevations correctly. The health app does not. The problem I have is no matter what app I use if its this health app or a pedometer app I try on my iPod touch or even if I try getting apps for walking on my Nexus 5 they don’t seem to want to count my steps! I shake the device and it does nothing. I want to start counting my steps but I can’t. :( help? Yea you need an iPhone 6 or newer, a Nexus 5 is not able to use the iOS Health app to track your movement. The step counter works well! My co-worker has a 5c and his app records his steps but mine does! How can that be I know everyone says 5c doesn’t have a motion sensor but how does his record it then??? I love the health app . I want to know how do I retrieve data from the previous day on the dashboard ? I saw it on steps recorded by the hour . Step tracker (pedometer) is only useful if you write down your stats every day. For those who only want to look at their daily stats at the end of each week – too bad. No daily number totals apart from the current day. 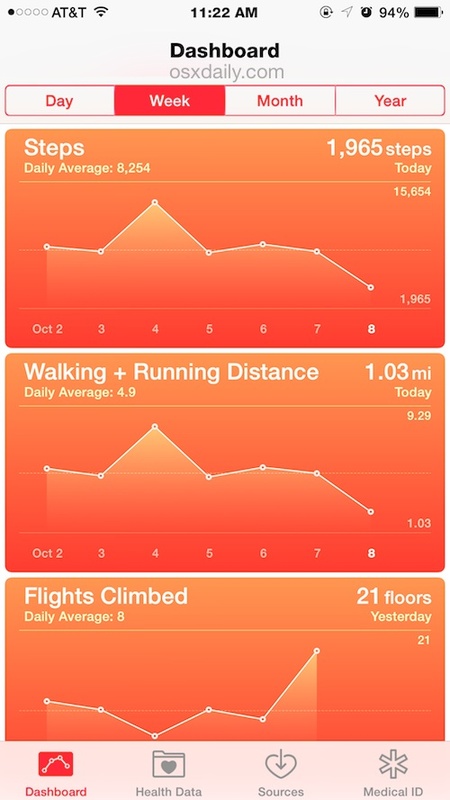 A totally useless feature is the step count by fractions of a minute….. Really??? But no day totals???? Developer must have left half way through the project….. I see many people here commenting that you can only see stats from today. That’s not true. click on the section with the graph for the day, then it goes to a screen that allows you to show all data. it has a total steps for each day and you can click on any specific day for a listing of all postings for that day. also, i’m not sure that the miles you run walks is anymore than a guestimate based on your steps. I sometimes walk in place to get a few more steps in at different times. I think the distance changes then too. And everyone’s stride is different, so if it just tries to measure distance by quantity of steps, that would explain why people get distance discrepancies. Does anyone know for sure if it measures by pinging where we’re at? I would think that would make our data usage on our phone go crazy. 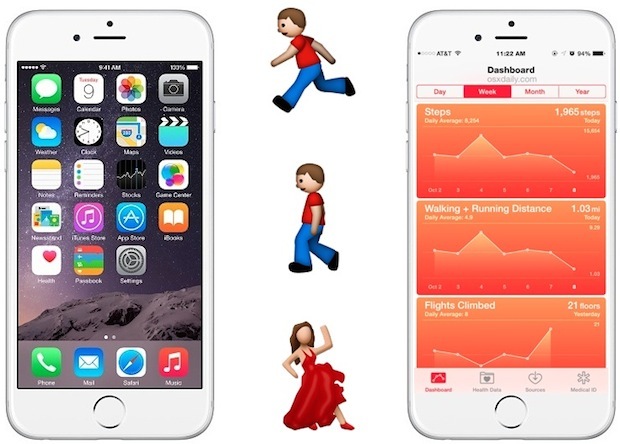 So the steps and walking-running features won’t work thru the health app if you have an iphone5? Does this work with I phone 5C as well? My husband, son and I all went on the same hike. We all have iphone 6’s. Mine read 8.69 miles. My husband’s read 10.87 miles and my son’s read 12.68 miles. All different floors gained as well. Clearly something’s not right here. Did anyone figure out how to calibrate the size of a step? I’m thinking this is why I also see big differences in the number of steps and total miles walked that my husband gets versus what I get? Hi, my wife and I get different readings as well, even though we have done the exact same distance or number of flights of stairs…we can understand the steps being different, she is shorter and has a smaller stride but she is not happy as it generally shows her doing 10-15% less mileage than me even though we’ve done the same distance. Let me know how you went and if you found a way to recalibrate or improve the accuracy. I find that the steps counter works pretty well for me, I don’t need it to be 100% exact, just good enough to give me an idea of my steps each day. My problem is with the walking & distance tracking, it’s always wrong. Take today for instance, my husband worked from home and hence didn’t move around much. He had about 1800 steps and .75 miles. I on the other hand had 5300 steps and .17 miles! Something is clearly wrong! Yesterday I turned the walking & distance off in the Health app then restarted my phone. Once I did that I noticed the distance was tracking more accurately, then today it went back into sucky mode again. Anyone else have this problem? Help would be appreciated!! I have the same problem when my wife and I walk. We always get different readings. She just did a long walk around an established route and the mileage was way off. Has anyone figured out if you can calibrate steps? Same problem others have mentioned. My husband always get higher readings on mileage when we walk together exactly the same distance. Is anyone else having a problem with the Flights Climbed section? My app does not seem to be counting stairs. For the record, I do have that turned on. Mine does not & has NEVER counted flights climbed. I carry this thing everywhere, have it turned on correctly & even have checked settings to make sure it’s all set there as well. Its very frustrating. it’s a 5s with all updates. So basically if you dont have a 6 or 6plus you can only get your walking stats? Thats kinda annoying that all my 5s can do is show me how far ive walked..
Precor Treadmill shows 3 miles and iPhone 6 shows 4. How do you CALIBRATE step length? Have run calibration on a track and on a linear measured mile, the app recorded 1.5 miles in both cases – anyway to calibrate the app? I have a 5s and since updating to ios 8 the distances are inaccurate. For example I have 8421 steps and distance of 0.04 km. now on ios 8.4, but still the same problem. Any suggestions to resolve this? My Health app doesn’t work anymore. When I first got the phone (6 Plus), it tracked accurately. Somewhere along the line, it just doesn’t work at all. It hasn’t tracked anything in months. I had an iPhone 5s (with the fingerprint home button, but very little storage), but that broke so I got a new iPhone 5s sans the fingerprint feature and way more storage. My old iPhone worked just fine with the health app to record all of my steps and distance, but this new one doesn’t work at all unless manually entered. Does anyone have insight to why this might be? One gets the total per week/month/year by multiplying averages by the number of days. I have an iPhone 5C and want to know how to have a pedometer on it. Is it built in or can I have one with an app? I also want to know if it can record steps when in airplane mode, which is how I’ll have it set for traveling. My iPhone is horribly inaccurate and inconsistent in its miles walked and flights climbed tracking. For example, I did a hike which I know to be 16 miles round trip and 4,500 feet elevation gain, but the phone registered this as 21 miles and 2,900 feet elevation gain. I did another hike which I know to be 2,100 feet elevation gain, but the phone registered this as 1,680 feet elevation gain one time, and only 1,100 feet gain another time for the exact same hike. It’s basically useless with that kind of inaccuracy and inconsistency. Is there any way to improve the accuracy? We have a small office and all of us have an IPhone 6 or 6Plus. We have been comparing our steps with each other like a fitness competition. Is there a way that we all can sync our Health Fit app together so that we can see each others progress in our step program? I use ‘Stepz’ as my step counter and ‘MyNetDiary’ for food/carb tracking with the sister app to help manage my diabetes. I’m unable to reorder my apps in the Health app to have ‘Stepz’ be the app that the step info is pulled from. I click edit and there’s a sorter bar only on the ‘iPhone’ option; however it can’t be moved below ‘Stepz’ so that the app I find to be more accurate and want to use for my activity data in ‘MyNetDiary’ is unable to be the priority over the ‘iPhone’. It shows ‘Stepz’ as inactive and I have everything turned on and selections made correctly as far as I can tell. I’ve been trying to figure this out for days and can’t find the solution. I keep having to go into ‘MyNetDiary’ and correct the steps info because the count it currently pulls from the Health App is so wrong based on what I know my activity to have been for any given day. I cannot figure out how to get ‘Stepz’ to be the app used over the iPhone. Also, I saw something where you could change what internal sensor of some sort within the iPhone to see it results are more accurate and for the life of me I can’t recall where I found that the other day. Any help would be appreciated. Thanks!! (iPhone 6, not latest and greatest version…got it in Jan 2015). Is there a way to get the number of steps I walked yesterday or on other dates? I can get the chart, and I can get that long list of how many steps each few minutes, but what I want is the total number of steps for a given day (not the current day). Amazingly enough, many people want this feature, but Apple has yet to implement it! It used to show the data by minute every time you tapped “show all data”, but now it shows it by day. It’s something simple, we’re just all missing it. I have a 6S plus and have everything set up, but my dashboard shows no steps. I have gone thru all the steps and still nothing. What do I need to do to fix this? I’ve forgotten my iPhone at home a few times while I’m out for a run. Is there any way to manually add my steps, distance, etc.? I carry my iPhone in my purse, not on me it will not work as a pedometer. I currently use a fitbit bracelet but would love to have some kind of pedometer that I can wear and then download steps to the Health Apple app. When I searched, there’s tons of info on apps but again, that assumes that I am using my phone as a pedometer. Suggestions? The Fitbit app on iPhone should have step count and other data as well! I still don’t get it. I’ve already enabled the three functions noted above: steps, flights climbed, and walking /running distance. But yet it still says “No Data.” Is there something else that I haven’t done? I just wished there was a simple “Start” and “End” feature on this app in order to track distance traveled. I don’t see why it can’t just be that simple. Hi do you know if it carries on counting steps if you turn the phone off? Walk around awhile with your phone in hand but turned off. See if you get s change is activity. I tried this and it worked for me. I think it’s giving me s longer stride than I have though. I just adjust for that mentally. For me if I want to walk a mile I look for a reading of about 1.33 miles. As several others have mentioned, Apple really needs to create the ability for the user to calibrate the step counter. In my case, it is off by about 30%, which seems far too high. I need to get the step counter up to about 13,000 to have confidence that I am near 10,000 steps for the day. By the way did one of the recent iOS updates change the graph? Mine used to be a line, but now it’s a bar graph which looks really ugly to me and I have no been able to figure out how to change it back to a line graph. I often walk around the four lakes in the city where I live. Each lake has a distance posted for the length of the walk around the lake. I have an iPhone 6+ and the Health app never comes close to the same distance that is posted. For example, one of our lakes says the distance is 2.41 miles but the Health app says I’ve only walked 1.9 miles when I complete the trip. The other thing I notice is that the same walk does not register the same distance in the app. Am I doing something wrong or does anyone have suggestions to make the app work more accurately. For now, just try calibrating the steps/distance ratio by using the height and weight settings…you may have to play with it some, but you can get it close. i did that and it still didn’t work! I have an iPod touch 5th generation. HELP!!! Does it have enough vestigial power when the battery turns off mid-power walk to keep recording one’s steps mileage so that it shows up in the total when the battery is recharged? how does the watch sync to the phone for steps? I am going backpacking and want to track my steps but will not have any connectivity where I am hiking for 6 days. I plan to use my watch to track steps and my phone for pics. Taking a big anker charger with me but want to make sure I don’t lose the steps I will accumulate. The iPhone and Apple Watch communicate with each other through Bluetooth first, then Wi-Fi secondarily. Cellular connectivity isn’t used as a syncing method between the two. Because Apple Watch relies on Bluetooth to communicate between it and iPhone, as long as they are synced, it should register the steps without a cellular signal. If you want to confirm that Apple Watch will track your mileage and steps while you backpack and away from connectivity, the simplest way to do so would be to go to an area without cellular reception and then practice. If you’re in a city location, often underground parking garages will have no cellular signal. Or if you have access to a radiology lab, those are often sealed off (as are some hospitals and medical facilities) due to their shielding. Just a couple ideas to test out your Apple Watch and iPhone. Anyway, have fun being off the grid! There’s something very peaceful about being away from a cellular signal and connectivity in this modern era! Is there a way to modify the app? Today it claimed that I walked 1.4 miles when, in fact, I had walked 3.14. I would like it to be more accurate. Why did my steps function all of a sudden stop working?